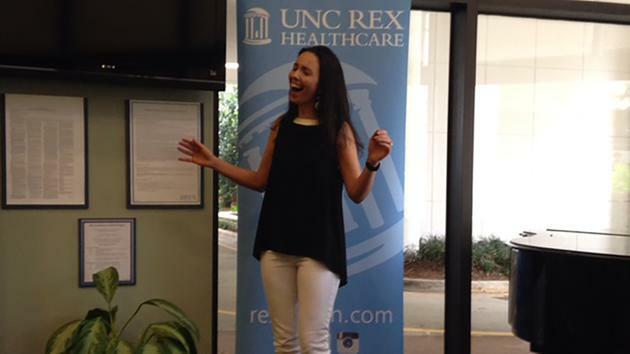 UNC REX announces the release of "What a Busy Day"
Nurses and hospital staff by day, talented singers by night. 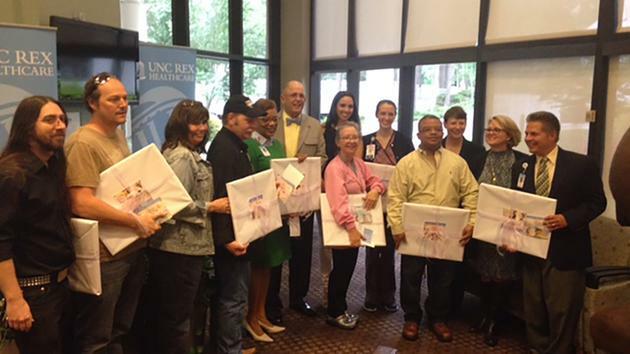 Thursday, UNC REX Healthcare officially released a CD of lullabies all produced by local healthcare professionals. The CD, made for new babies and their parents, was the brainchild of Meghan Presnell. She was a professional singer in Nashville before she returned to Raleigh to become a mother-baby nurse at the Rex Women's Center. "My mom, ever since I started working here, would say, 'you need to sing happy birthday to the babies because you see them on the first day of life.' But the last thing a new mom probably wants is for someone to come into the room singing happy birthday after she's gone through labor," Meghan laughed. Still, her mom's advice led to an even better idea. "So I was just sitting in the pod one day with one of our nurses and I said 'you know, it would be so great if we could give something back to these parents,'" Meghan recalled. "And we have so many talented musicians here, although you wouldn't know it. But I hear them singing around the halls and word gets around. It would be so great if you could give this gift to them and have this be the first music the babies hear, their first lullabies! So Meghan rallied her coworkers and together they recorded seven songs, including two originals. Among those featured on the album A Busy Day are fellow nurses and administrators. Even the piano accompanist is a former State Trooper who now performs car seat safety checks outside the Women's Center for all new parents leaving REX. "It was amazing the way it was produced! We only had four practices, and so all of us went into the studio and we came together sounding so good, it was amazing," exclaimed proud pianist Chris Morris. "We all walked into it not knowing what to expect we have all different sorts of talent levels. And I wasn't really sure what to expect and it turned out to be the most organic and beautiful project!" Meghan professed. The group officially released their CD at a launch party at Rex on Wednesday, just ahead of Mother's Day. And on Mother's Day, all new moms at the hospital will get a copy. As for the rest of us, copies of the CD are available in the Rex gift shop for just $5. Proceeds go to the Rex Healthcare Foundation Women and Children's Fund. The CD really is the gift that keeps giving, as studies show listening to music with your child helps with development and improves cognitive skills. "Music therapy, there's absolutely evidence to support that it's beneficial in newborns," Meghan explained. Meanwhile, the release of the CD was personal for Meghan and her mother. Her mother's favorite song has always been "Somewhere Over the Rainbow," and she'd long begged her daughter to record a version of that song. But, it wasn't until now that Meghan finally recorded it. It was a surprise she presented to her mother, a fitting gift for this Mother's Day.